When we are grilling meat for dinner, I like to use the grill for the rest of the meal as well. One of the easiest way to grill vegetables is layered on skewers that are lightly brushed with a seasoned olive oil marinade. I have a few different types of metal skewers which I prefer, but you can also use inexpensive wooden skewers also, just soak them in water for 30 minutes before you use them. You can use a variety of vegetables including red, yellow, or orange peppers, zucchini or summer squash, cherry tomatoes, onion wedges, mushrooms, slices of corn on the cob, or chunks of fennel. Just try and cut all the vegetables into pieces about the same size so they cook evenly. Mixed grilled vegetables offer a variety of nutrients to your meal. Choose different colorful vegetables to get the most nutrients possible. 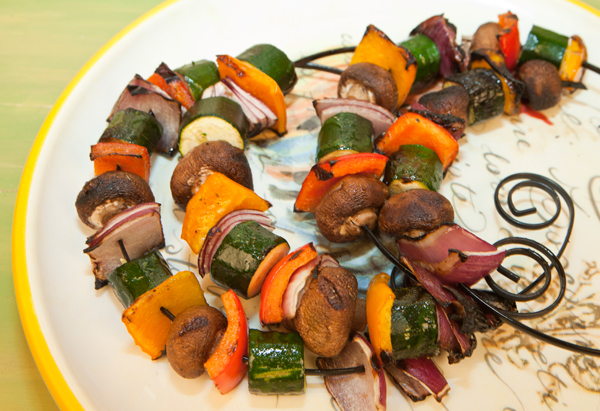 Threading mixed vegetables on skewers to be cooked over the grill is an easy way to prepare a tasty side dish. Thread the vegetables onto the skewers, carrying the vegetables on each skewer. Place the skewers in a baking pan, and brush with the marinade and let rest 15 minutes. Cook the skewers on the grill turning frequently and brushing with the marinade. Continue to grill until cooked through and slightly charred, about 10 mins total.